Our Overclockers.com Folding@Home Team has been running member spotlights for quite some time – this is the 84th feature in our series of Folding Spotlights! Dfonda: When did you join the Team Sydney? Sydney: Sept 28th 2009, although I had been folding for at least a year with another team that died. D: If there was something recent that you did that you wanted your fellow team members to know about, what would it be? S: My guide to “Linux Folding” , detailing how to set up the Linux CPU client and getting the GPU2 client to work under WINE (Nvidia only,sadly). D: What Part of the World do you live in, and if you don’t mind telling, what town? D: How did you initially hear about F@H? D: After starting, why do you continue to Fold? S: It’s competitive (and very addicting, I might add) and serves a good cause. D: What do you do for a living? S: I am a student, still living with my parents. D: What do you do for fun? S: Play video games, practice martial arts, go out drinking with my friends. D: Is there anything special you do in your spare time that you really enjoy? S: Pulling a good all nighter LAN!! D: Time to spill your guts. What are the stats of your main folding rig? Why is it your fave? What all do you use the rig for? S: Well I only have a single rig, which serves as my gaming and workstation as well as folding PC. ASUS Maximus Formula X38(Rampage X48 BIOS), E8500 @4.0 GHz. 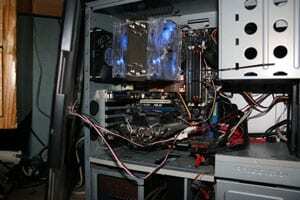 True120 with dual 120mm fans., 6GB DDR2 @840MHz 5-5-5-18, 8800GTX @ 650/1000 HR-03+, (Adding an 8800GT), Gigabyte Odin GT 800W PSU, Antec P182, 2x320GB RAID 0 for my operating systems., 1TB + 2x500GB+200GB for storage. D: What are your future goals? What do you most want to accomplish with your life? S: I don’t really have any goals at the moment. I am just finishing school and hitting milestones! D: If there is something you want to tell the team, then spill your guts! What have I missed in my questions that could help the team learn more about you and who you are? S: I am 18 years old and a diehard Linux “Fanboy”!! D: A few Pics of your Farm, Hobbies, even you! Etc. Thanks for being on the Team Sydney . Its a pleasure to know more about you and your other interests.